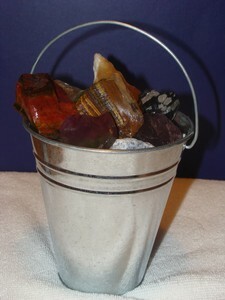 Type : 2 1/2 LB of rough rocks in a Galvanized metal bucket. 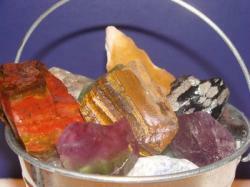 This is a great gift for anyone who loves rocks and gems. 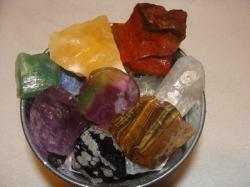 All rough rocks will be about 1/2 to 2 inch size pieces. Rock typically included are Amethyst, Citrine, Emerald, Apatite, Tigereye, Calcite, Flourite, Tourmaline, Aventurine, Quartz, Bloodstone, and more.